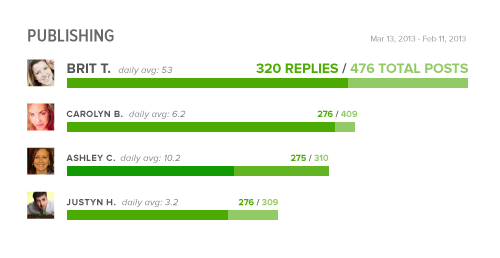 Today, we are pleased to announce a brand new report in Sprout Social — the Team Report. If you are currently taking advantage of our collaboration features such as tasking and collaborative publishing, you’re going to get a ton of value out of this report. Sprout Social already empowers managers of social media, customer service, sales, or marketing teams to assign and track tasks like publishing an update or responding to a customer engagement to individual team members. 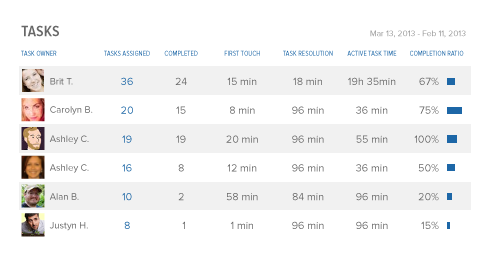 These new metrics allow you to see how different members of the team are performing in terms of keeping up with assigned tasks and customer engagement. To be specific, Sprout Social now delivers publishing, responses, and task metrics at the individual user and team member level. These new metrics allow you to see each user’s activity which will help you make better decisions about managing your front line social team. 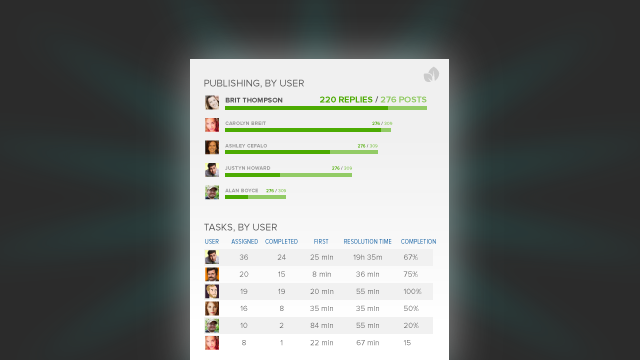 The publishing section surfaces active team members that are posting messages and replying in your group. You’ll also get a snapshot of each team member’s “daily average of messages sent.” Inactive users are not shown on the report. The Task section provides “assigned” and “completed” task counts and detailed metrics on critical steps along the way to successful task completion. The Team Report is available for Sprout’s Professional, Advanced and Enterprise plans. The report is live and available to the owner of the account, as well as admins. 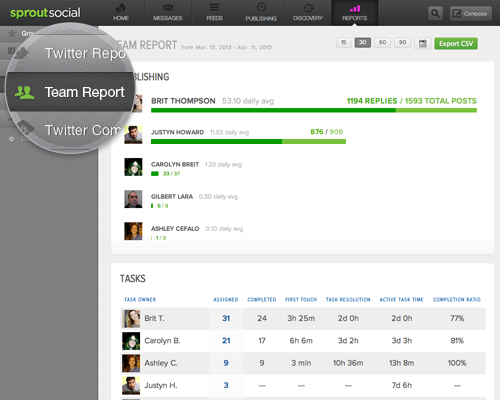 If you want to adjust who can view the report, tweak the visibility controls in Sprout Social’s settings. If you’re not already a Sprout Social subscriber, don’t sweat it: You can sign up for a free trial at our website to explore these and several other metrics and features for managing your brand’s social media presence. We hope this new angle of social reporting is as useful to you as it is to us here at Sprout Social. Follow us on Twitter to stay current on all of our product updates. We’re working on a lot of exciting things and we can’t wait to share more with you. Stay tuned!